Well, did ya think I'd forget this one? HaHa, not a chance! 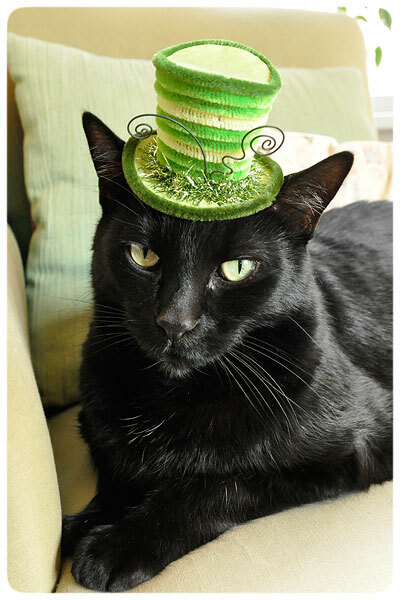 I had a spurt of St. Patrick's day inspiration over the weekend and set to work on a mini leprechaun hat for Mr. Jack. This was serious business indeed! 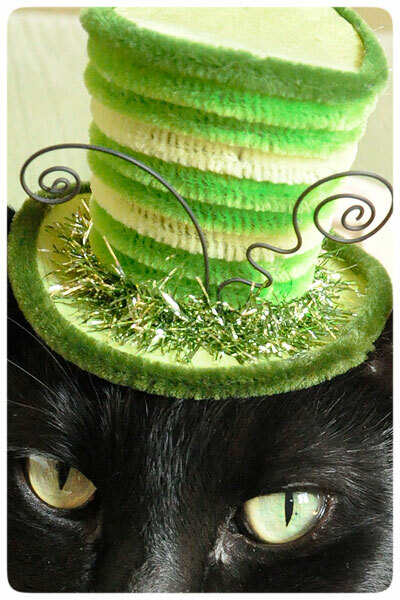 Of course, Jack knew I was up to trouble and sat at my feet while I wrapped various shades of green chenille, round and round my handmade hat. He always seems to know when I'm making him a new seasonal accessory! Luckily, and I mean LUCKily, he was a good sport when it came time to take his photo. He simply would have no part of the ribbon-under-the-chin combo, so I just set my silly hat on his head and he proudly posed. Cheers to all and ENJOY Jack's latest holiday fashion! Don't forget to wear your GREEN, and to leave a jolly comment here for GOOD LUCK!